Keeppy :: How to deal with Sports Injuries? Athletes react to injuries with a wide range of emotions which may include denial, anger, sadness and even depression. An injury often seems unfair to anyone who has been physically active and otherwise healthy. Although these feelings are real, it’s important to move beyond the negative and find more positive strategies to cope with this setback. In many cases dealing gracefully with an injury helps an athlete become a more focused, flexible, and resilient athlete. Here are some sports psychology strategies you can use for faster injury recovery. If you end up with an injury, make sure to give the body a break to avoid making the injury worse. During the early stages, rest and only exercise when you know that you're not using the affected area during workouts; that may mean swimming or dumbbells instead of running or lunges if you've got a lower-body injury. Worried about sports injuries? Don't sweat it. Think of avoiding injury as just another part of playing by the rules — only this rulebook is the one that keeps you from getting hurt. That's because the best way to deal with sports injuries is to prevent them. Prevention includes knowing the rules of the game you're playing, using the proper equipment, and playing it safe. When an injury happens it is usually when the well stocked first aid kit isn't available! However we can still do a certain amount to help the injured athlete. If an athlete falls to the floor or is hurt then here are the first three things that you should do. Calm the athlete by staying calm yourself and talk to them. Give him or her space keeping everyone away. Move them to a quiet area if the condition is not serious. Try and keep the athlete from moving and immobilize an injury to stop pain and prevent further harm, for example for an injured arm, position it close to the body using a support bandage if you have one, or use a towel or other suitable item. Find out as much information as possible to enable you to deal with their injury, for example did they suffer a direct blow or did they fall. Have they been ill or had other problems recently. It is very difficult to know if an injury is a sprain strain or fracture, unless the skin is broken and you can see a broken bone. Treat suspect sprains and strains as fractures, keep the arm supported and immobilized and help the athlete seek medical advice. 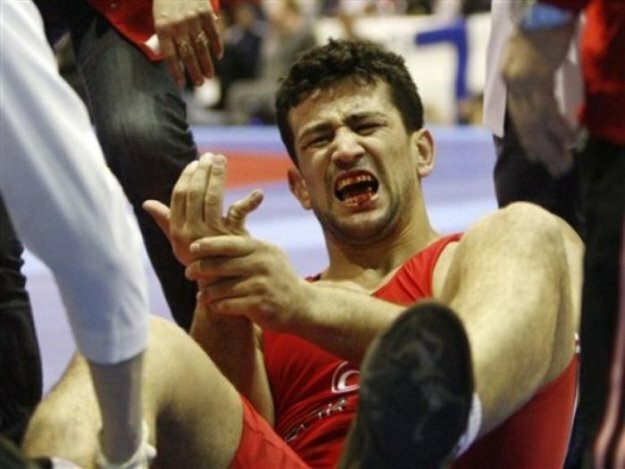 Where is the injury, how severe is it, and how will it affect your sports? Treatment of Sports Injuries in the Young AthleteAlthough not common, back and neck injuries can occur in young athletes who participate in sports. Though injuries that cause back pain are not the most common cause of injury in the young athlete, they can cause frustration. Most athletic injuries to the back are sprains of the ligaments or strains of the muscles. However, several more serious conditions can have symptoms similar to a routine sprain or strain. Many injuries occur after repetitive overuse of the structures of the spine. Therefore, proper treatment of a young athlete always includes a good physician evaluation with imaging studies when necessary. Drawing on social networks to stay connected to your team or sport. Social networks are also great for commiserating with other injuries folks who may have great rehab tips. Social networks show you that you are not alone on the sidelines. Using imagery to ease pain and promote healing. Taking care of the mind/body connection can help you heal faster, by promoting loving care toward the injury rather than hating your foot for being injured and wanting to cut it off (well, that’s how I felt, anyway). Working through feelings of anxiety around perceived decrease in performance and ability once you return to your sport. The feeling that you might not be as good as your were before the injury plague the emotionally untrained athlete. Try to work through this anxiety long before you return to your sport.